Sometime in the late 80s (I think it was 1987) I had a near out of body experience meeting the one and only Jim Henson. It was almost by accident. At the time I was working as an inbetweener/assistant animator for a small animation studio in New York City - and I heard through co-worker friends that Jim Henson was going to be the guest speaker at an ASIFA meeting (Association International Film Animation). I wasn't a member, but somehow I still managed to slip in with my ASIFA card carrying co-workers - and there I was, sitting at the legs of a legend. 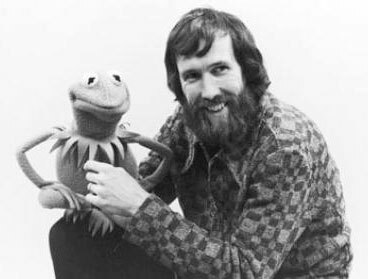 It was a small, intimate gathering in a classroom setting - and Jim Henson was quick to wonder aloud himself why he'd be asked to be there. He admitted he had done some animation before for Sesame Street, but didn't think his work in that area was all that noticed within the animation industry. I admit, I didn't know - up until that evening - that Henson had done any animation at all, until he showed us a few of his clips on a 35 millimeter projector, and then instantly I recognized his work! He did the Sesame Street animated pebbles, the King Of Eight (which he also voiced), as well as other recognizable Sesame Street segments - like the one where an orange comes to life and turns an ordinary kitchen into an Italian opera. He showed a bizarre pre-Sesame Street avant-garde film he did called "Time Piece" in which he was featured (in top hat and tails) running about and painting an elephant pink. It was real artsy and tripped out - when it finished the classroom erupted in applause. He seemed genuinely touched that we were so appreciative of these early works of his that he was not generally known for - but it wasn't long until the talks migrated over to his muppet creations. 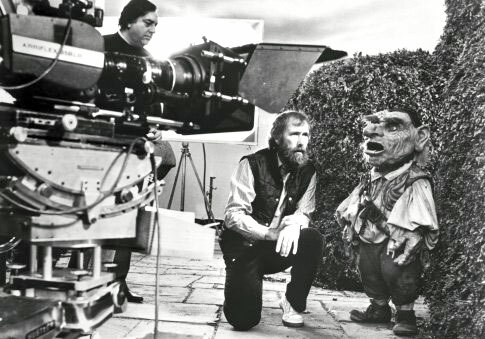 Jim Henson directs on the set of Labyrinth. This was around the time "The Storyteller" was on TV - and in fact, I recall his daughter was with him as well, and she brought along the sheepdog muppet featured in the Storyteller series. Henson had just come off his "Labyrinth" movie, which although a bit of a cult classic these days - did not fair as well in the box office when it first premiered as he had hoped it would. He spoke candidly about what he had tried to achieve with that movie - and said that there was so much more that had to be cut from the film that perhaps would've better explained the complex relationship between the Alice In Wonderland type of character, Sarah, and the Golbin King played by David Bowie. Produced by George Lucas and with Monty Python's Terry Jones involved in the screenplay, it somehow seemed like a better idea on paper than it appeared on screen - and Henson was clearly disappointed, almost apologetic. Sitting almost at arms length away from Henson, I will always remember just how genuine and down to earth he seemed. When he spoke - and this is the most wonderful part I remember - you couldn't help but think "Jeez, that's Kermit!" 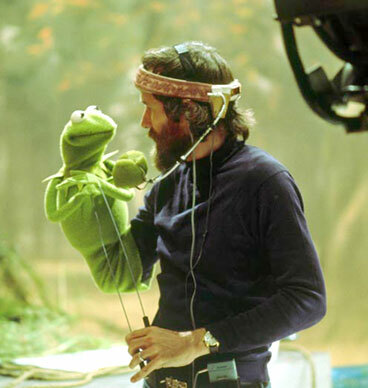 - as Jim's natural voice wasn't all that different from Kermit's, only perhaps more subdued and measured - and here he was talking about all these things that from this side of the TV screen seemed so magical and so deeply embedded into my childhood memories. The added treat was that he was so willing to give us all a glimpse into what you couldn't see. He explained how during shooting scenes with the muppets that all the puppeteers would be viewing direct camera feeds of their performances on tiny monitors by their sides - never looking up at the muppets on their arms, or each other - but instead viewing exactly what home viewers would see. I didn't know until then, that the Big Bird costume worn by puppeteer Caroll Spinney, actually has no holes in it at all where he'd look out from. Instead, he too, viewed his position totally from a tiny monitor inside that was strapped to his chest. It was abundantly clear that what seemed so effortless to us, was actually much more complex then we knew - and done with such mind blowing skill. Fascinated by creating illusions he'd sometimes further trick the viewer's eye by adding some type of visual and mechanical manipulations. In the opening scene of The Muppet Movie, where you first see Kermit, he's sitting on a log - in the middle of a swamp - singing and playing a banjo. What you don't see is Jim Henson, underneath, in a specially built metal container submerged under water - fed oxygen through an air tube. Someone in the room mentioned the scene where Kermit rides a bicycle, and Jim smiled "Yes, everybody always mentions the bicycle scene. That's why in the second movie you notice we did it again, although with a whole bunch of muppets this time!" Other facsinating illusions mentioned were the tiny little animatronic Doozer construction workers in Fraggle Rock and the magnificent life-sized dragon featured in the Jim Henson Hour. 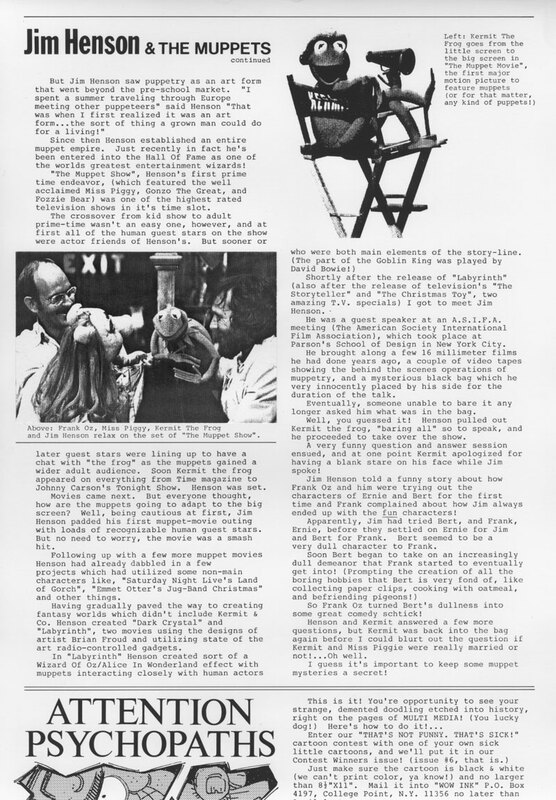 But Jim never let the mechanics take over, as he explained "Every time we'd use mechanics we tried to keep them very un-mechanical, because as soon as the audience starts thinking about the cleverness of it all - they're no longer thinking about the performance. 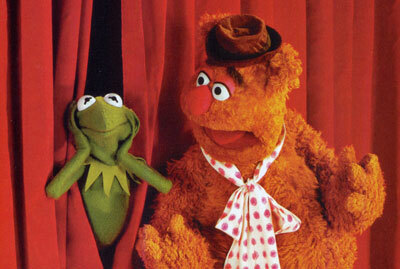 When the Muppets are on the screen, I want the audience to believe in the moment." A clip from The Muppet Show. Making it all look so easy - "Time In A Bottle" performed by Jim Henson. On a less technical note, he told a funny little story about how when he and his close friend and collaborator Frank Oz were first trying out Ernie and Bert (the lovable room mates from Sesame Street) that it was Jim who first picked out Bert, but then felt somewhat more at home with Ernie - and his mischievious pranks. Frank, who was now handling a second-choice Bert, asked "why is it that you always get to play the fun characters?" But then, in time, began to really get into Bert and his penchant for all things dull - like collecting paper clips, cooking with oatmeal, and befriending pigeons. "Suddenly he was so dull he was hip!" quipped Henson. Suddenly he pulled out Kermit, and my out of body experience kicked into high gear. "Hi-Ho, Kermit The Frog here!" Henson wasn't one of those performers who didn't want you to see how things worked. Kermit, with his legs dangling below him said shyly... "Well, here I am... (looking down at Jim's arm) uh, bearing ALL so to speak!" And then Jim opened up the floor to questions. I asked Kermit "In your last movie it seemed you and Miss Piggy got married. Is this true?" And Kermit did one of those nervous gulps and said, "Despite whatever she might say, no... we are not married. Uh, that's my story and as they say, I'm uhh... I'm stickin' to it." It was great. I got the answer straight from the frog. Not the greatest question, but hey... I would be kicking myself all the way back home if I didn't at least say something - and besides, how many people can say they talked to Kermit The Frog, man to frog? A bit later I wrote an article about the muppets [page 1, page 2] in a self-published newsletter I did called "Multi-Media" and I sent a copy to the Henson company, never expecting a response. 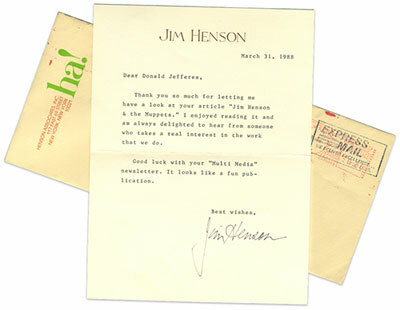 Imagine my shock when I actually got a note from Jim himself a few months later - typed and signed on Henson stationery, with a bright green "ha!" on the envelope (for Henson Associates). "Thank you so much for letting me have a look at your article" it said. "...always delighted to hear from someone who takes a real interest in the work that we do." 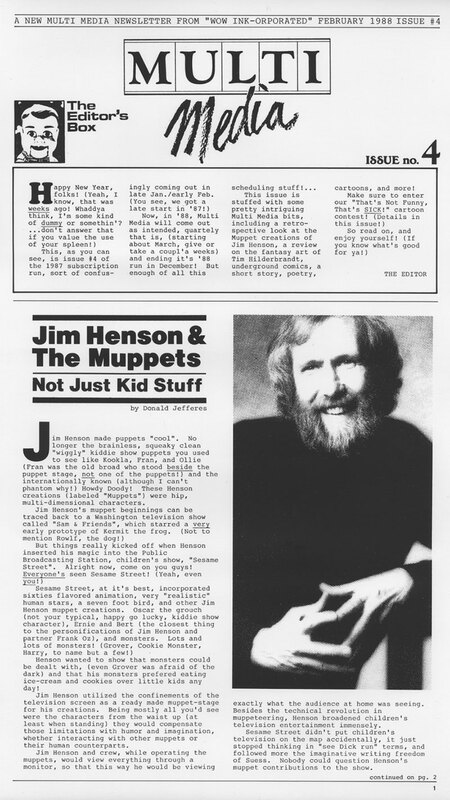 "Real interest" would be an understatement... in my opinion Jim Henson is one of the all time great imagineers of our time, who's influence, humor and creativity goes beyond anything I could possibly put in words. Thanks Jim, thanks for everything!